Unique and one of the last authentic apartments available! 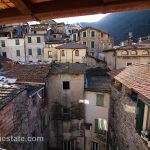 At the third floor in the historical city centre of the medieval Dolceacqua we have this to be finished large apartment for sale 110 m². Considering the size, the high vaulted ceilings and just above the cosy village square it is one of the last available, so a real opportunity. It is a pleasure to enter the historic building in view of the old tiles and the beautiful slatestone stairs with cast iron railings. The apartment is located at just a few minutes’ walk of the cosy centre with all necessary facilities like bars, restaurants, shopping etc. besides that it is just a 15 minutes’ drive to the beautiful beaches of Camporosso Mare and the lively city of Bordighera.